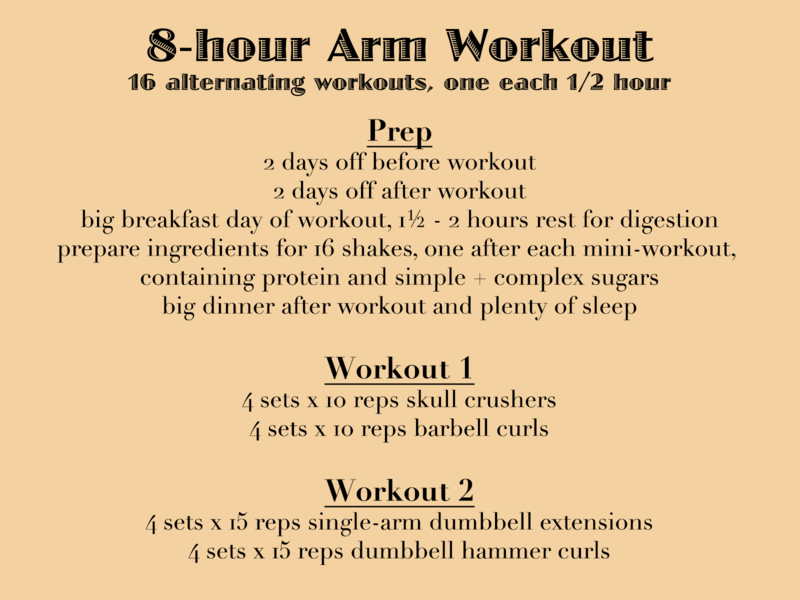 I’d like to show you a marathon 8-hour arm workout that is not for the weak of heart (or body). This is for the dedicated few that really want to go the extra mile in order to grow. If you’re thinking of posting a comment complaining that this is too grueling, too taxing, can’t be done without steroids, then this isn’t for you, please go look at photos of kittens. We all reach certain stages in our workout routines when we need to shock the body and this workout will definitely do the trick — if you can get through it, and most people can’t. I’m thinking of doing it in the near future and will let you know once I get it done. You’ll understand it best once it’s explained to you in this video featuring Rich Piana. Don’t be fooled by his tattoos and intimidating demeanor, he’s a nice guy who’s been publishing all sorts of informative bodybuilding videos. Just in case you still haven’t got, I made an infographic, a guide to help you out. Just print it and you’ll be set. Chris, thanks for the feedback, but you do know this isn’t Rich Piana’s blog, right? And that he most likely won’t know you posted your comment here and won’t read it? I’m not affiliated with him in any way. This guy is a beast, and I’ve been following him for a couple years now. Just a beast. Even with injuries, he still keeps going. Doing what it takes to make a champion’s physique. Great post, man.